← Is climate sensitivity low or high? 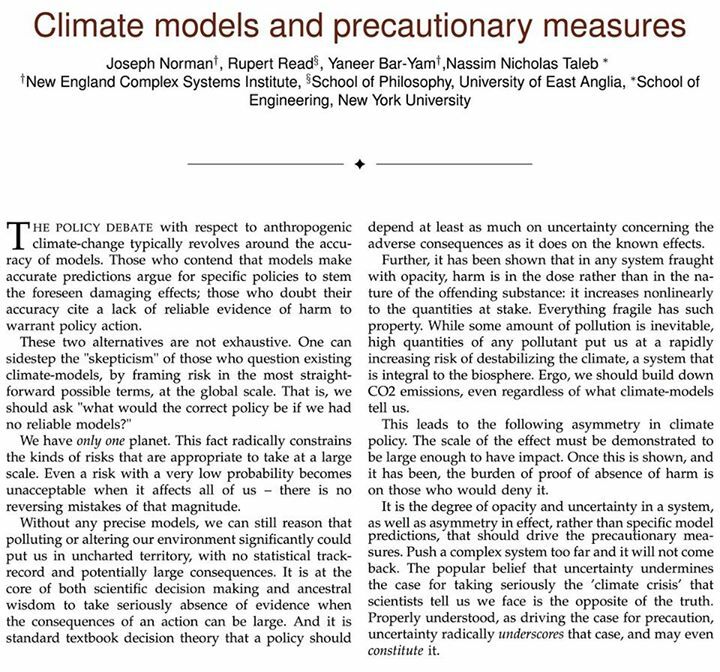 In a recent article by prominent academics – Climate models and precautionary measures – it is contended that the climate debate is about the accuracy or otherwise of climate models. Those who believe in climate models argue for specific – but unspecified – policy. Those who hold models to be inaccurate – they say – believe that there is no proof of harm sufficient to warrant action. As a chain of reasoning it breaks at the very first link. Models are known without a doubt to be inaccurate. It is called ‘irreducible imprecision’ and has been known about since Edward Lorenz plied his convection models in the 1960’s. Models can have slightly different starting points as a result of uncertainty in inputs. Many solutions are thus possible – for a single model – that diverge exponentially over the calculation period. Irreducible imprecision is shown in the diagram below. It is from a paper by Julia Slingo – head of the British Met Office – and Tim Palmer – head of the European Centre for Mid-Range Weather Forecasting. It is quite demonstrable math but mention this on any global warming blog and the inhabitants will exhibit severe agitation and fear and loathing as cognitive dissonance kicks in. However – it is not quite right either to claim that models are inaccurate because they fail to reproduce the lack of more recent global temperature rise. Instead what the modellers have done to is to arbitrarily pick one of the possible solutions – and discard all the others – based on expectations of how climate will evolve. The choices are too hot – what a surprise. Their advice – as we have only one planet – is that climate uncertainty requires that unspecified precautionary action be taken to mitigate greenhouse gases. As climate is utterly unpredictable using models – we might have to gloss over the uncertainty of costs and benefits. But let me fill in the detail for them. The policy from global warming progressives involves tales of the collapse of western civilisation and capitalism leading to less growth, less material consumption, less CO2 emissions, less habitat destruction and a last late chance to stay within the safe limits of global ecosystems. And this is just in the ‘scholarly’ journals. The progressives are right in one respect. Economies are fragile – movements on markets can be fierce – recovery glacially slow sometimes. There are economic problems – but the problems are not intrinsic to capitalism. They were created by poor judgement. We blundered into it through stupidity. It is not difficult – however – to imagine scenarios in which markets are deliberately destabilised to hasten the end of capitalism. Creeping tax takes, overspending by government, printing money, keeping interest rates too low for too long, or too high for too long, penalty taxes on primary inputs, implementing market distorting subsidies – the scope is endless. These are suspiciously the objectives of global warming progressives – but let’s not call it a conspiracy. Let’s` just call it stupidity. The rational management of economies requires interest rates to be managed through the overnight cash market to restrain inflation to a 2 to 3% target. Markets need fair, transparent and accessible laws. Including on open and fair markets. Optimal tax take is some 23% of GDP – and budgets are balanced. Markets operate best in a robust democracy. These nuts and bolts of market management – mainstream market theory and practice pioneered by F. A. Hayek – keep economies on a modest and stable growth trajectory as much as is possible. Economic growth provides resources for solving problems – restoring organic carbon in agricultural soils, conserving and restoring ecosystems, better sanitation and safer water, better health and education, updating the diesel fleet and other productive assets to emit less black carbon, developing better and cheaper ways of producing electricity, replacing cooking fires with better ways of preparing food, etc. We can sequester carbon in agricultural soils and in conserved and restored ecosystems, reduce nitrous oxide and harmful tropospheric ozone and save money on fertilisers, burn methane to produce low cost electricity, reduce the strong climate effects of black carbon and the millions of premature deaths that result from cooking over open fires at the same time. We can develop low cost alternatives to the fossil fuels we know are increasing in scarcity and increasing in cost. We are not married to coal. While it is true that we do have only one planet – our concern for it extends well beyond CO2. Population, development, technical innovation, multiple gases and aerosols across sectors, land use change and the environment are the broader context. 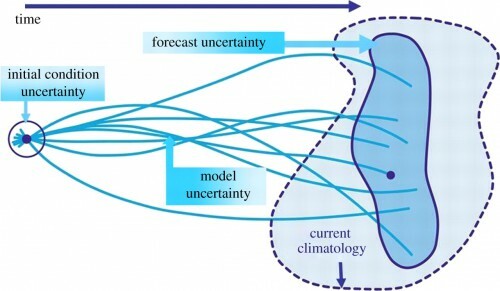 I would be the last one to suggest that there isn’t more uncertainty in a system with the internal dynamics of the Earth’s climate – and much more scope for severe and rapid change than even the modellers contemplate. However – the solution to the multiple problems of people in the world are both simpler and more complex than overthrowing democracy and capitalism. The energy solutions are technological – primarily a gas to advanced nuclear strategy if nothing better comes along. Communities on a growth path can look after themselves. Management of the global commons is a messy and complex human problem requiring the most modern theories and models of human behaviour – well beyond the simplistic response of caps and taxes on energy. Environmental management involves the strategic deployment of methods and technologies across landscapes, industries and infrastructure – and for implementation requires a different approach than top down government regulation that is failing both business and the environment.